Hola Amigas. I had the pleasure of teaching two lovely ladies 4 techniques on Tuesday. Here is one of the cards that we made. This one uses the watercolor crayon technique. I forgot how fun it was to use the crayons. Here are quick instructions. Choose your stamp. Here I used Gently Falling. Wet your stamp using an Aqua Painter. Pick about three colors. Here I choose More, Mustard, Chocolate Chip and Rose Red. Color your wet stamp with each color starting with the lightest color first. When your happy with color saturation stamp on your cardstock or watercolor paper. Once it is dried use the line imaged stamp to stamp over the solid image. Here I did so in Early Espresso. Over the next couple of days I will show you the other cards we made. 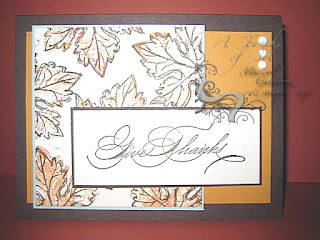 If you would like to take a class with me to learn this technique and more or need the products to create this card please feel free to email me. SUPPLIES: ALL STAMPIN' UP!